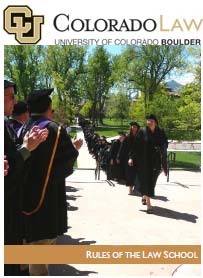 Colorado Law's curriculum provides students one of the best comprehensive legal educations in the nation, employing a solid foundation in the fundamentals of law, robust theoretical inquiry, doctrinal and policy analysis, real world experience, legal reasoning tools, and professional skills. Our faculty members are passionate about teaching and are committed to providing a well-rounded learning experience that prepares students to serve wisely and with professionalism. Juris Doctor Program Requirements. The most common program is a full-time, day, three-year degree. We also offer a 2 ½ Year JD Option. Master of Studies in Law (MSL) Degree: Full- or part-time, day, one-year degree program for non-JD seekers. Concentrations in ethics & compliance and human rights.